Industry Experts, Inc. announced the publication of the global market research report on Advanced Drug Delivery Systems. The new report entitled “Advanced Drug Delivery Systems – A Global Market Overview” reveals that the global Advanced Drug Delivery Systems market for Pulmonary is slated to register a fastest 2017-2024 CAGR of 6.5% and reach a projected US$31.2 billion by 2024. The report reviews, analyses and projects the Advanced Drug Delivery Systems market for global and the regional markets including the North America, Europe, Asia-Pacific and Rest of World for the period from 2015 to 2024 in terms of USD. The market for Advanced Drug Delivery Systems carrier types analyzed in this study includes Nanoparticles, Polymers, Monoclonal Antibodies and Others (includes Prodrugs, Microparticles etc.). The Advanced Drug Delivery Systems market, in terms of route of administration, analyzed in this report constitutes Oral, Parenteral, Topical and Others (includes Rectal, Nasal, Implants etc.). The report also includes the market analysis for Advanced Drug Delivery Systems applications comprising Oncology, Cardiology, Neurology, Pulmonary and Others (includes Diabetes, Ophthalmology, Gastrointestinal disorders, Urology etc.). The worldwide market for Advanced Drug Delivery Systems is segmented into four major global regions namely, North America, Europe, Asia-Pacific and Rest of World. These regional markets further analyzed for 14 independent countries across North America – The United States, Canada and Mexico; Europe – Germany, France, The United Kingdom, Spain and Italy; Asia-Pacific – Japan, China, India and South Korea; and Rest of World – Brazil and South Africa. 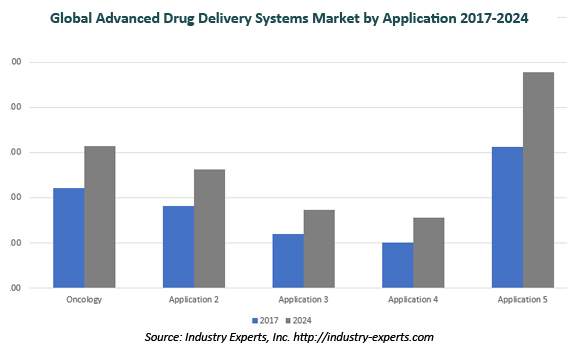 This 422 page global market report on Advanced Drug Delivery Systems includes 297 charts (includes a data table and graphical representation for each table), supported with meaningful and easy to understand graphical presentation, of the market numbers. The report covers the brief business profiles of 18 key global players and 39 major market players across North America – 24; Europe – 11; and Asia-Pacific – 4. The report also provides the listing of the companies engaged in research and development, manufacturing, supply of advanced drug delivery systems. The global list of companies covers the address, contact numbers and the website addresses of 204 companies.